Current Israeli leadership Doesn’t Seriously Consider Returning Golan, Writes Ray Close in an email. After dinner, Hal Saunders produced a largescale map of the Golan Heights, and invited us all to gather around him as he unfolded it on top of a grand piano. Hal started by explaining the latest Israeli proposal for the location of the ceasefire line that was to separate Israeli and Syrian forces. It had been prominently delineated on the map in a broad green felt-tip pen, as I clearly remember. After Hal explained that the line had been drawn personally by Moshe Dayan, he pointed out the location of various Jewish settlements that had been established after the Six-Day War in June, 1967, which the Israelis insisted would have to be on their side of the new ceasefire line dividing the Golan Heights. It was not a jest. I think that anecdote confirms that there have been times when the Israeli Government deliberately encouraged Israeli civilians to take physical possession of critically important geographic locations simply to create valuable bargaining chips for future use in a larger strategic politico-military game. I can think of no other plausible explanation for such cynical dismissal of courageous and dedicated pioneers. I wonder how many of the 25,000 settlers living on the Golan today realize that 35 years ago the much-revered Golda Meir once ruthlessly characterized their forerunners as nameless pawns? However, I also wonder how any realistic person today can possibly believe that the current political leadership of the State of Israel is sincere when they hint that they might consider returning the Golan Heights to Syria as part of a negotiated peace bargain. Ray, the good news is that the current leadership is not even hinting they will return the Golan. We’ll just have to wait a bit more … no rush. 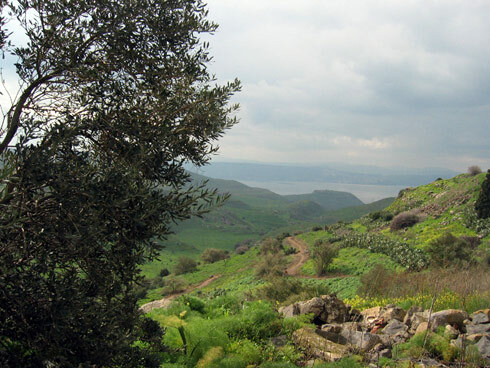 One of the first settlers on the Golan, Dr. Yigal Kipnis, confirms Ray’s message about the original purpose of the settlements – to serve as negotiation cards if peace would ever become a subject of discussion. Yossi and I were supposed to meet Dr. Kipnis on the Golan during our visit, but in the end it didn’t work out. We’ll interview him via email/phone in the coming weeks. Although Dr. Kipnis still lives on the Golan, he is one of the first to have announced his readiness to leave, as part of a peace agreement with Syria. In fact, out of recognition (and perhaps agreement) with the very purpose of the settlements, he remains there for precisely that reason. We hope to learn more about his views soon. Alex, I agree with you, we (all) need to wait a while longer. With your “other President” (Ghadry) now gone, Bibi will have no choice but to speak to Bashar. If he doesn’t, Ray’s map might be carried by Mitchell and Clinton from now on, on every visit to the region. It is only a matter of time before Bibi will realize Israel has no choice. The settlements, and the Golan, were never meant to be ours. And, unfortunately and fortunately, they won’t be. I agree. I would wait a bit longer. I’m sure, in time, Bashar will “loosen up”.